There are scores of potential patients and clients in your area, searching for the types of services and solutions you offer. 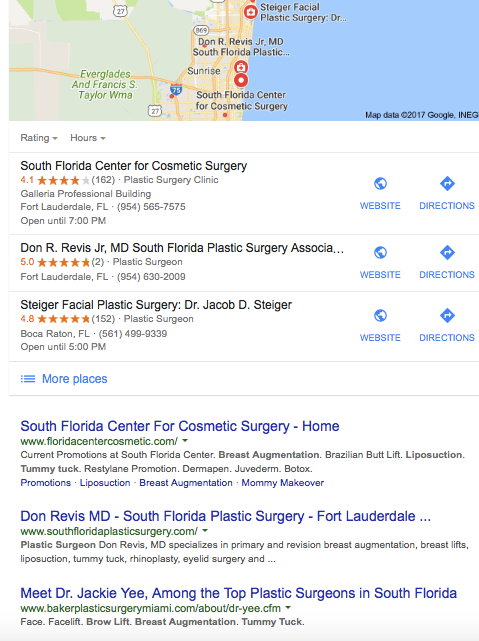 Local plastic surgery SEO enhances your visibility in organic search results — driving traffic, conversion, and results. People looking; make sure they find you. If you’re trying to get into prime SEO shape, you need workout moves that will help you get a three-pack. Wait. Don’t you want a six-pack? Not when it comes to local SEO! The Google Local 3-Pack highlights three businesses in the organic search results. These listings are highly visible and feature a broad-view map. The results also contain vital information (e.g. address, phone number) and quick links to the website and Google Maps for directions. This appeals to busy searchers, particularly those using mobile devices. Moz conducted a click and heatmap analysis of 200 clicks for a given search term. Paid results (above the 3-Pack) accounted for 30 clicks, the 3-Pack for 69, the More Local Places link (right below the 3-Pack) for 12, and the organic results for 45 clicks. These four areas accounted for 156 (78%) of the clicks. This indicates that among organic (i.e. non paid) results, the 3-Pack is highly advantageous. But if you don’t make it, ranking as high as possible in the regular organic results is also beneficial for your practice. So, let’s get to it. How do you optimize your place in search results? NAP. First, the workout, now the NAP. When searchers seek local businesses, Name, Address, and Phone information is often their focus. This is especially true when they are near the end of their buyer’s journey. Make sure your NAP is consistent throughout your website and across all online platforms (e.g. social media, directory listings). Pro Tip: If you have an 800 number, swap it out for a local number. Google, and potential clients, prefer a local exchange. Local keywords. Liposuction or plastic surgeon are incredibly vague and will return millions of irrelevant results. When potential patients conduct a search, they’re looking for procedures and surgeons available in their area. Try instead: liposuction in South Florida or best plastic surgeon in Florida. 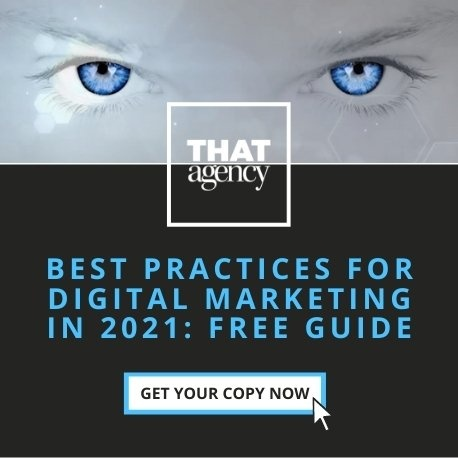 Pro Tip: If your practice has more than one location, create an optimized page for each. Make sure these pages are not identical and that they use keywords with the location (e.g. breast augmentation in Dade County.) Include each location’s NAP, location-specific services and content, and an embedded Google Map. Google My Business. Think of this tool as a central hub. Through it, you can increase online visibility, manage your online profile across Google platforms (e.g. search, Maps, Google+), assist customers in finding your practice, and tell them your brand story. Google My Business also enables you to share content (text, photos, video, events, links, etc. ), analyze your online visibility and engagement, manage reviews, access your Google Analytics dashboard, and start a Hangout to interact with current and potential patients. Pro Tip: Learn more about Google My Business and add or claim your practice today. Reviews. As you’ll notice in the 3-Pack above, each of the results has a starred review count. This is attractive to Google (it helps the search engine determine your credibility and will push up your rankings), and it is important to searchers. It’s long been known that consumers trust their peers more than they trust brands — at least until they form their own relationship. When it comes to plastic surgery, prospective patients value the input of people who have had the same types of procedures. Ask your patients to consider leaving a review. Pro Tip: Make it easy and convenient for patients to review your practice. Send them an email inviting them to do so, and include a link to your Google My Business profile page. Directories. Make sure your listings on directories such as yellowpages, Yelp, and your local Chamber of Commerce are up-to-date, keyword optimized, and consistent in terms of NAP. Directory listings, especially those with reviews, help build visibility and authority. 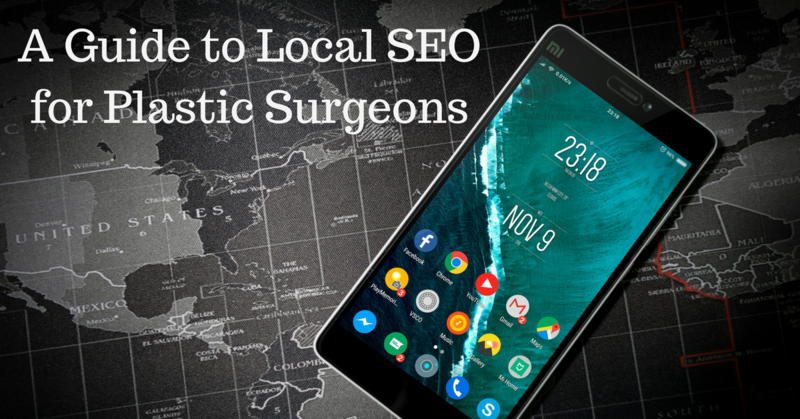 Local SEO is critical for plastic surgeons; it can help draw potential patients and clients to you. They are looking anyway; your team should be the one they find. Consult with a firm that specializes in plastic surgery marketing so you can shine a spotlight on your practice.